The default payment term of the debtor is set in the Name profile of the debtor (under Pricing & Terms tab | Debtor Control section | Terms field). Assuming you have set the payment term of the debtor as “Within Days” and “30” days following (that is 30 days payment terms). 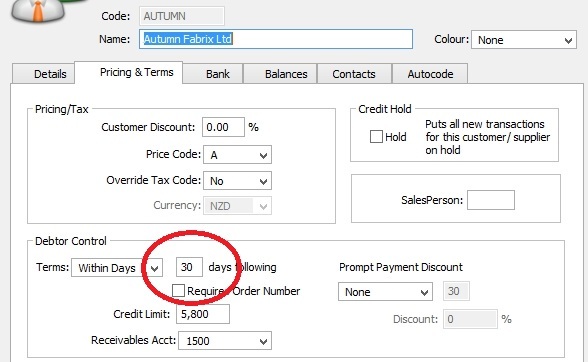 This setting will allow MoneyWorks to calculate the “Due Date” (30 days from the Transaction Date) in the Sales Invoice transaction. However, if you need to change the payment terms of an invoice from 30 days to 60 days, you can change it at the Sales Invoice transaction itself (without amending the payment terms in the Name profile) by click on the “arrow” besides the Due Date to change it. 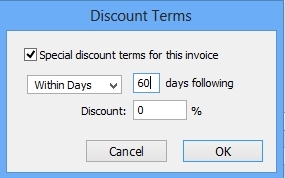 In the Discount Terms window, check the checkbox for “Special discount terms for this invoice”, select “Within Days” in the term drop down list and enter “60” in the “Days following” field. This will change the Due Date from 30 days to 60 days from the Transaction Date (Invoice Date). This entry was posted in Accounting, MoneyWorks, MoneyWorks v6, MoneyWorks v7 and tagged accounting software, Accounts Receivable, mac accounting software, MoneyWorks, MoneyWorks Singapore, Singapore, Small Business Accounting Software, software. Bookmark the permalink.